Debi Lorence brought W. Verne McKinney Elementary students apples from her farm as part of the school’s October Harvest of the Month program. Food Hero and Oregon Harvest for Schools have free posters featuring different Oregon grown fruits and vegetables. Posters are available in English and Spanish. In Oregon, these programs are supported by Oregon Harvest for the Schools. 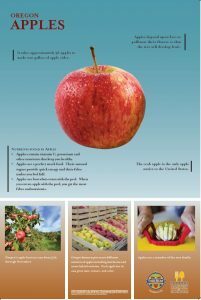 This partnership between Oregon State University Extension Service’s Food Hero and the Oregon Department of Education provides schools with free materials for educating students, staff, and their families about a wide variety of fruits and vegetables produced in Oregon. When W. Verne McKinney Elementary School (Hillsboro, OR) applied for an Oregon Farm to School grant, they made the Harvest of the Month an integral part of their program. Piloted last spring, this program has already introduced students to kiwi, purple broccoli, red d’anjou pears, and—you guessed it!– apples. No two Harvest of the Month programs are quite the same, but McKinney’s takes it a step further than most. In addition to featuring an Oregon Grown product each month, McKinney invites a person involved in the product’s production, processing, or distribution into every classroom. 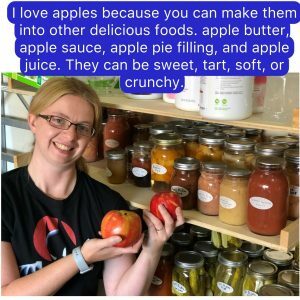 School staff also provide endorsements for the product, letting students know exactly what they love about it, and how they prefer to eat it. Crystal, McKinney’s 4-H educator, shares with students what she loves about apples in this harvest endorsement poster. This October, the Harvest of the Month began early on a Friday. Students gathered in the auditorium and participated in a virtual farm tour—a five minute video created by Oregon Agriculture in the Classroom that introduced students to the month’s harvest–Apples–, and the classroom visitor involved in the apples’ trip from farm to table–local Debi Lorence. Then, in the classroom, students worked with their teacher to generate questions for the guest, who then visited every classroom, answering questions and providing each teacher with enough samples for their entire class. The final step was the taste test—students were encouraged to use descriptive language and all of their senses when evaluating the product. McKinney students will repeat the process in November, this time with local Hazelnuts! 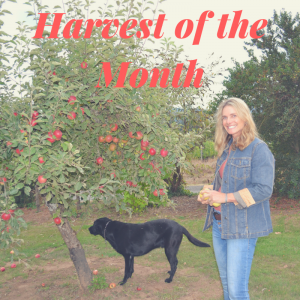 Harvest of the Month programs are only one way to connect students with their local food system, and to encourage healthy dietary habits. How are you celebrating National Farm to School Month? Let us know!